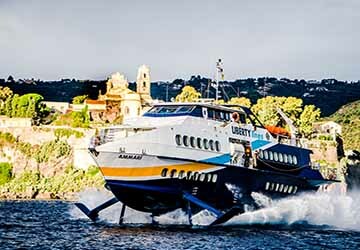 The Aeolian Islands are nestled in between the mainland of Italy and the island of Sicily - naturally there is an extensive network of ferries that whisk visitors to the numerous islands from these two locations. From Mainland Italy, the port of Napoli in the south of the country is the major hub for ferries to the Islands, while Milazzo and Palermo are the departure ports for the crossings from Sicily. Lipari is the largest and busiest island in the Aeolian region, and its history means that visitors can admire a variety of striking pieces of architecture. To get the best possible perspective of the island, it is essential to view the scenery from a great height, and the volcanic nature of Lipari has created a number of excellent vantage points - Mount Saint Angelo is amongst the very best of these. For locals and tourists alike, the Feasts of Saint Bartholomew have pride of place on the cultural calendar during the month of August. As its name suggests, Vulcano is an island that gives visitors the chance to walk right into volcanic craters that have naturally formed on an immense scale. The island itself has a relatively tiny population that solely relies upon tourism, and as such visitors are always guaranteed a warm welcome - Vulcano residents operate a number of different restaurants that offer examples of the cuisine that have made the Aeolian Islands famous around the world. Fresh fish dishes are influenced by the position of the islands, and washing it all down with a glass or two of Malvasia delle Lipari is a fantastic way to end your meal. When travelling by car to any of the Aeolian Islands, it is advisable to get the latest information in advance about the vehicle types that are allowed on each individual island. Restrictions are often in place to protect the serene and un-crowded nature of the islands, but once you get off the ferries there are a number of opportunities for bike and scooter rentals. 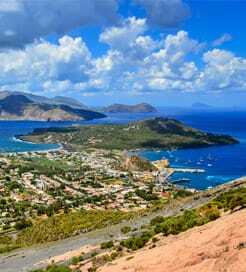 Getting there is only part of the fun, and using the ferry network to explore the region will show you exactly how the Aeolian Islands offer tourist experiences that cannot be found anywhere else. For more information, please visit our Ferries from Sicily to Aeolian Islands page. For more information, please visit our Ferries from Italy to Aeolian Islands page.